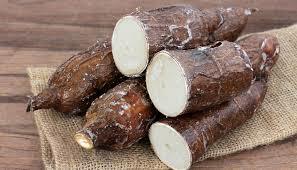 2lb yucca root (aka cassava) – can be found peeled and frozen in most Asian and Latin markets, if you can’t find fresh. 1-3 fresh bird’s eye chiles, or chiles of your heat tolerance and flavor preference. If using fresh yucca root, peel and set in water with lemon juice. Chop into rough cubes and boil in fresh water with 1 Tbsp salt until tender. Drain and reserve cooking liquid. If you are using frozen yucca root, just thaw and chop. In a medium, thick-bottomed soup pot over medium high heat, toast the spices for a moment, stirring, until seeds begin to pop and leaves are aromatic. Add the chiles, stir until fragrant, then immediately add tomatoes, yucca and enough cooking liquid (or water, or unsalted vegetable stock) to just cover the vegetables. Simmer for 15 minutes, adding more liquid if needed. Mixture should be more stew than soup. Add green beans to heat through. Serve in heated bowls topped with plenty of crispy shallots and a dollop or two of some spicy chutney.